There’s something so felicitous about a meal that wasn’t meant to be a meal, about a mishmash of ingredients that added up to something greater than the sum of its parts. 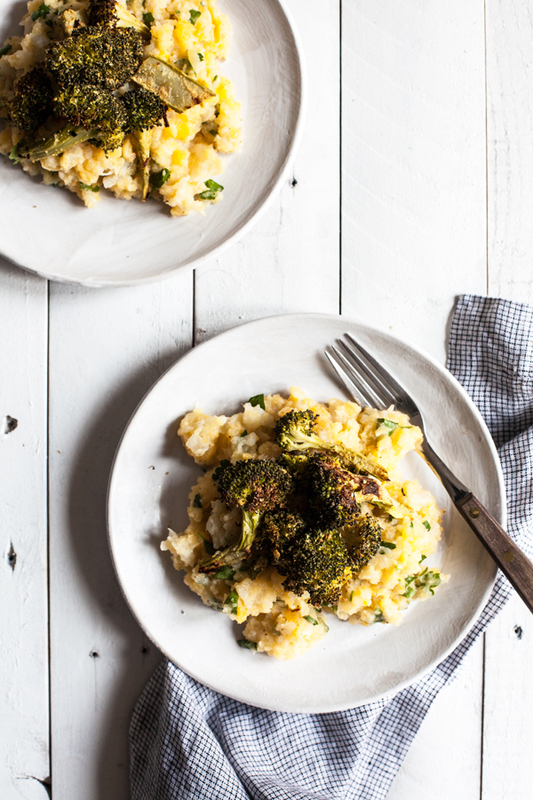 This simple plate of cheesy vegan roasted broccoli with smashed root vegetables was really meant to be two side dishes: the roasted broccoli on the one hand, the rutabaga and turnips on the other. Once I’d gotten around to preparing both, it occurred to me that they’d play nicely together, and suddenly my attempt to use up the produce in my fridge had amounted to lunch. The star of the dish is the broccoli, a simple vegan spin on roasted broccoli with parmesan (which I used to love, love, love in my pre-gan days). This is one of those dishes that I’m shocked I haven’t made yet, and now that I have, I’m sure I’ll be roasting up trays all the time. 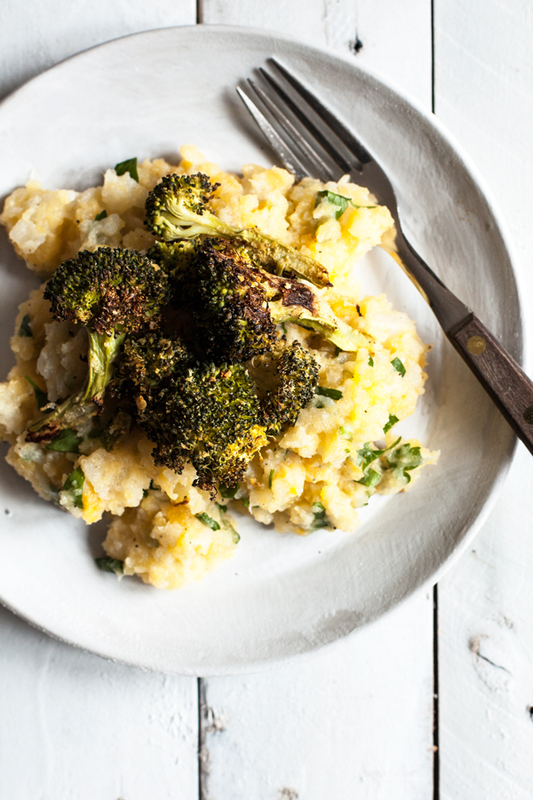 The nutritional yeast gives the broccoli savoriness and cheesy flavor, and the red pepper flakes a touch of heat. It’s a great way to prepare broccoli for bowls, pasta, or as a simple side dish. 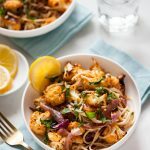 Smashed root vegetables are a winter mainstay for me, a perfect pairing for baked tofu or tempeh, beans, sauteed greens, and more. (Sometimes I even enjoy them as a snack, which I know is a little strange.) What I’m sharing here is my most basic for making them. As you’ll see, I like to smash them roughly and leave plenty of texture; they’re not mashed potatoes, so the goal isn’t something pillowy or smooth. You can use parsnips, turnips, rutabaga, celery root, winter squash, or a combination of any of these; for this recipe, I used turnips and rutabaga. Feel free to add any seasonings or extra to the mash that are calling your name; I offer my personal favorites at the bottom of the recipe! Preheat your oven to 425F. Trim and peel the broccoli stems. Cut the broccoli crowns into small florets and the stems into small pieces. 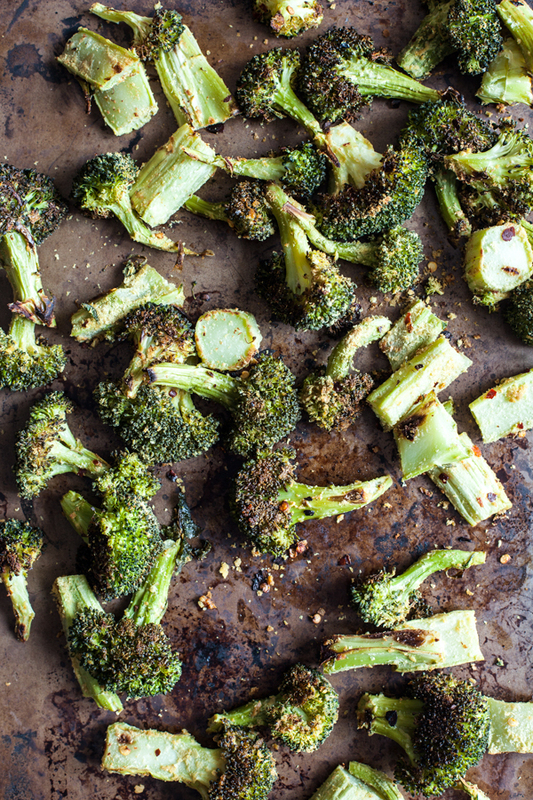 Toss the broccoli with the vegetable oil and nutritional yeast. Place it onto a lined baking sheet and sprinkle generously with coarse salt, along with crushed red pepper to taste. Roast for 25-30 minutes, or until the broccoli is tender and golden. While the broccoli roasts, bring a pot of salted water to a boil. Peel the rutabaga and turnips and cut them into large cubes. When the water is boiling, add the root vegetables. Boil for 20 minutes, or until the vegetables are tender. Drain them and add them back to the pot, along with the non-dairy milk and nutmeg. Use a potato masher to mash them roughly, leaving some texture. Add salt and pepper to taste and fold in the parsley. Add some hempesan or vegan parmesan and/or any other mix-ins of choice. 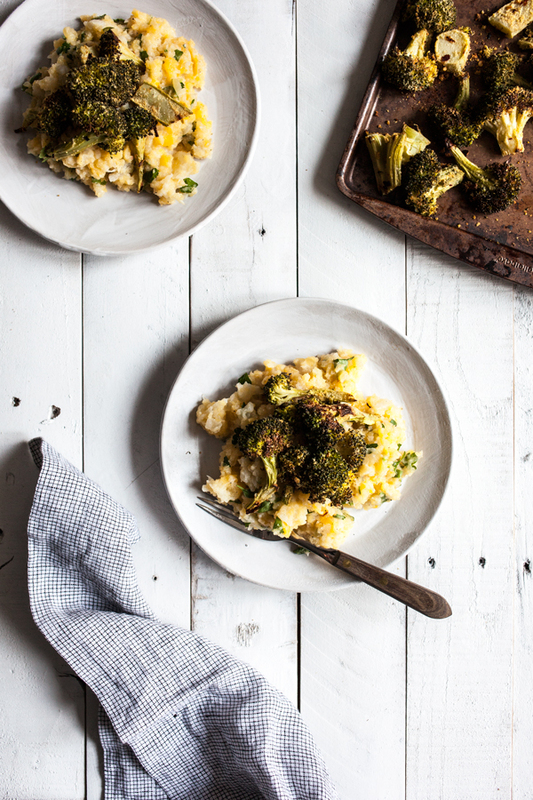 Divide the root vegetable mash onto plates and top with a generous handful of the cheesy roasted broccoli. Serve. On it’s own, this is a light meal. You can increase the nutrient density and make it more filling by adding some beans, baked tofu, your favorite vegan meat, or perhaps some of my baked lemon pepper tempeh cubes. It’s a lovely, comforting dish to make while root veggies are still in season. Before I go, a quick thanks for the kind comments and emails during NEDA week. I’ll be back in a couple days with my new favorite (!) toast recipe. The best meals are the ones where you pair two things on hand together and they create something great together. I have to try your cheesy roast broccoli now. I’ve never tried rutabaga or turnips before, but dang this makes me want to! Looks so cozy and homey! Hi Gena, just found your blog and I love it. 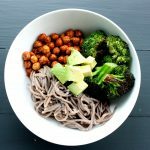 Broccoli is one of my favourite foods so I must try this recipe! Thanks for sharing. Ok, that’s it, nutritional yeast is on my grocery list! I can’t believe I have yet to try it. 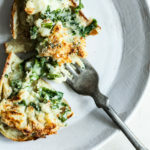 These roasted broccoli crowns look irresistible! Thanks for sharing this delicious recipe. I have made it at home but I added some green peas and little bit fried onion. I was really delicious. This recipe is very easy and healthy also.